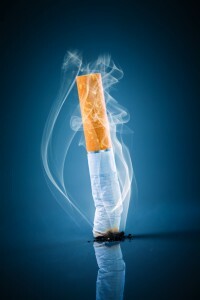 While it is common knowledge that tobacco use can cause your teeth to turn yellow, many patients don’t realize that there are a number of other serious problems directly associated with smoking cigarettes. From my patient focused dental office in Burlington, MA, I strive to not only help my patients achieve optimal oral health and wellness, but to provide them with important information that can help them make informed decisions as well. Today, I’d like to explore some of the lesser known effects of tobacco use. Discoloration of the teeth and foul breath are common among longtime smokers, though the real threat posed by tobacco use may not be as readily apparent. The nicotine and additives in cigarettes can lead to inflammation of the salivary gland openings located on the roof of the mouth. When the pH balance within the mouth is disrupted, the patient’s chances of developing gum disease are increased. Add to this the inherent dangers of increased plaque and tartar buildup, and you have a recipe for advanced periodontal issues down the line. With periodontal disease come the increased risks of tooth loss, heart disease, pulmonary hypertension, and even some forms of cancer. The risk of developing oral cancer itself is a prime motivating factor for quitting smoking, as tobacco users are significantly more likely to suffer from this aggressive disease. If you notice any abnormalities of any kind – including white or red patches in the mouth, unexplained bleeding, unusual pain or tingling, or ulcers that do not heal – it is important that you contact my office for an evaluation. My goal is to ensure your lifelong oral health and comfort, and I will always provide you with the information and tools you need to achieve just that. Over the past several years, more and more studies have concluded that there is a definitive link between oral health and overall physical wellness. When your teeth and gums are in great shape, your chances of maintaining good systemic health are considerably higher. If you’d like to learn more about how smoking affects your oral health and how treatment at my office can help you keep your smile shining brightly, contact my office in Burlington, MA today. My staff and I happily welcome patients from throughout the surrounding areas as well, including Billerica, Woburn, Bedford, and beyond.